For the past decade, the entire African continent has been generating an overwhelming and increasing amount of business initiatives in the form of startups and economic groups that tend to lead the new generations to a development that is already opening many opportunity doors in terms of education, technology, health, economy, employment and many other fields. Year after year entrepreneurs in Africa have found support in many ways. This necessary support has been given to them by important institutions and with the funding they have received from different sources like economic groups such as incubators and accelerators that believe in the potential the initiatives of startups in Africa have. Many genius ideas have given birth to small business, young entrepreneurs are now fighting for, in order to become big and successful one day. Networks of talented people and amazing ideas are becoming the focus of great investors. In order to continue the growth of these networks and the creation of new connections between the principal actors of the leading innovation entities among Africa, it has become important to generate the proper spaces for this magic to continue happening. Therefore a series of important events, spaces and meeting are being continuously planned and held throughout every year, inviting startups, entrepreneurs, VCs, accelerators, incubators or a big variety of attendees that will happily participate because of the huge opportunities they can find in this type of events that will benefit all of them. This year, like every year, an important number of events have already been announced to take place all around Africa. Some African countries have shown more interest than others, but the truth is that young startups from all around the continent are already planning to assist and participate in these events with the interest and purpose of making the right connections and growing their network of possible influencers that can become a key part in the journey their businesses have started. Here you will find the list of 6 of the most attractive coming events for African startups and digital initiatives in 2016. Africa is growing in a way it has never grown before. There is hope in people, in the young generations and the children that will become the future of the continent. Silicon Cape is now claiming its place in the tech universe and the world is discovering the great things Africa can offer the digital universe. Event description: The event is a 10 day startup journey for young African entrepreneurs to interact with leading and successful startups from the world, to attend to masterclasses at important Indian universities, to get mentored by recognized Indian CEOs, participating in a Pitching Room with possible VCs and angel investors and many other interesting and enriching activities for their future growth and development. Event description: It is the 18th version of the MWA. This event´s main purpose is to contribute to the growth of the mobile sector in West Africa. It is the leading technology event in the region. It organizes business oriented conferences and facilitates industry development by gathering stakeholders and entrepreneurs together, encouraging interaction and evolution among them. Event description: This event is a combination of presentation, panel discussions, workshops, private business meetings and networking opportunities for attendees who are most likely the potential main actors of the African digital future. The IAD has been organized to support Africa´s digital growth and development that will contribute to the continent’s general growth and development. Event description: The Africa.com event is one of the most important tech events in Africa. It gathers important stakeholders and decision makers from the digital ecosystem in the country and worldwide. Event description: The Digital Media Summit is an all-day event where innovation leads the latest trends of the digital world in the continent and attendees will witness the great potential here is among all of those who are interested in participating. Event description: It is known as the most disruptive startup and tech festival and conference in Africa. The event will offer talks, workshops, exhibitions and the possibility for young startups to get funded by important VCs and angel investors. Throughout their careers, Olorogun Michael and Cecilia Ibru have been dedicated philanthropists, focusing on a wide range of initiatives across Nigeria. However, through the continued development of the Michael and Cecilia Ibru University (MCIU) project, both will be dedicating themselves to their true passion: education. Olorogun Michael Ibru has already proved himself a friend to aspiring students in Nigeria, founding what is now known as Ibru College, serving on the Provisional Council of the University of Benin, and contributing to many other schools and education-focused organizations. While Dr. Ibru joined her husband in much of this philanthropic work, she also hopes to carry on the legacy of her family, who were instrumental in bringing opportunities for education to their homeland. 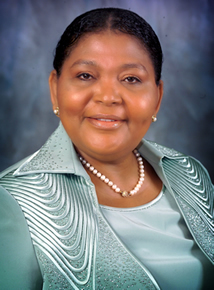 Cecilia Ibru’s family has been deeply involved in education in Nigeria. Her grandfather, Chief Ogegede Ogekpo, was known for saying “akpo rutcha na, akpo re pene,” or “the future is the world of the pen,” and provided the land for the first primary and modern schools in Aladja. In addition, Chief Edward Sido, Dr. Ibru’s father, established the region’s first free private primary school as well as the Sido College of Commerce (since renamed United College of Commerce) in the early 1960s. Today, joined by Olorogun Michael Ibru, Dr. Ibru hopes to create, in MCIU, an institution of higher learning every bit as transformative as the schools founded by her father and grandfather. For more information, visit www.mandcfoundation.org.